Our company is actively involved in exporting and supplying of Synchro Transmitter and Receiver. Synchro Transmitter and Receiver is used to undertake study of selsyn. The Synchro Transmitter and Receiver has two dials for input/output angular displacement. 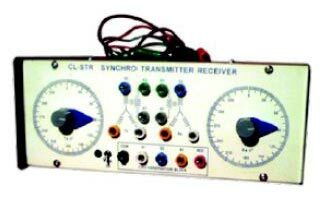 This Synchro Transmitter and Receiver also comprises of knob with large pointers. Two dials for input/output angular displacement. Knob with large pointers on transmitter and receiver. Sockets for rotor (R1, R2,R3) and stator (S1, S2, S3) on panel. Built in isolated power supply. Attenuated output on sockets for signal observation on CRO. Users Manual with patch cords.